It’s a saying that you’ve probably heard over and over again, but have you ever actually thought about the meaning behind it? Constant Contact conducted a survey where we asked small business owners how much an hour of their day is worth, and it turned out to be a whopping $273! The astonishing thing in that survey was not just the value of time, but the fact that those businesses spent approximately 33 hours per week on marketing activities. That’s a lot of time … and a lot of money. Social media is a large part of most businesses marketing efforts, and it’s one that can easily take a great deal of time. What if there were simple things you could do to help you dedicate less time to social media and more time to other parts of your business? There are many different official definitions for curating content, but curated content is simply the act of sharing content written by someone else. This allows you to increase the amount of information you’re sharing with your target audience, and make sure to never forget to give the author credit for their work. Many small business owners worry that if they’re not sharing their own content on their social media channels they’re plagiarizing; but the fact is, as long as you give credit to the author you’re in the clear. Curating content allows you to save time by no longer having to create every single piece of content for every social channel you are on. Plus it’s a great way to build relationships with other experts like you. Best practice suggests that you should be tweeting between 5 and 9 times a day, and posting on Facebook once or twice a day, the only way you will truly reach that goal is by mastering the art of curating content. Tip – Use an RSS Reader to comb through multiple blogs on one website. 2. Find tools to manage and schedule updates. If you’re hopping from platform-to-platform to engage with your audience, too much of your time is being spent moving around the internet. That’s where social media management tools can help. Tools like Hootsuite and MarketMeSuite allow you to engage with all your social networks from one convenient location. Once you’ve set-up one of these tools, there’ll only be two places you’ll need to look for engagement on the internet: your social media management tool and your inbox. Talk about a time saver! Management tools also have one other feature that can help you save time while implementing your social media strategy … scheduling! Using management tools, you can schedule for many different social media accounts in one sitting. 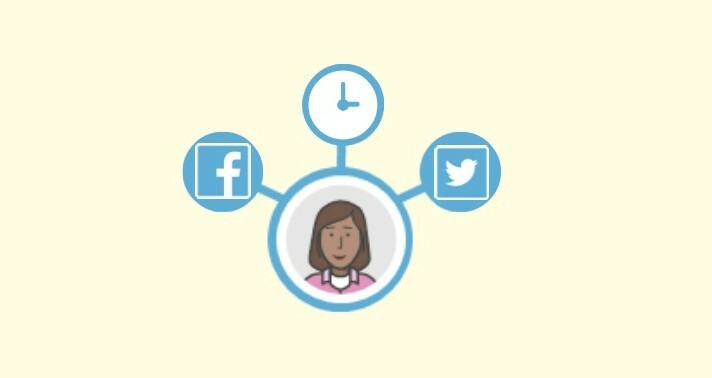 Your social media accounts will now be active, even when you’re too busy to be sitting in front of your computer. Tip – Don’t set it and forget it. Take some of your new-found time to interact with others in real-time and create relationships through conversations. With most of us owning a smart device these days, you no longer have to be at your computer to create social media content. When you’re sitting in a coffee shop before your busy day begins, pull out your mobile device and schedule content before you’re too busy to think about it. Use apps like Feedly for curating content, the Hootsuite app to manage your content, and PicStitch to create collages to share immediately with your social networks. There are also apps like Pocket, which let you store all of the great content you find online in one place, until you’re ready to share it. With these apps in your back pocket, you will find your busy day a little more relaxing. Knowing that you no longer have to carve out time to schedule social media content, will give your extra time to be more engaged once your followers start to interact with your content. Tip – Take pictures of your business and employees throughout the day, create a collage and upload them as a new piece of social content. To save even more time, you need to stop over-thinking social media. We tend to over-think most things we do, especially when it’s business related. One of the biggest advantages to being a small business owner is the authenticity you can give your brand. Be yourself, be real, and be honest; you’ll find social media takes a lot less time when you just share what represents you and your brand. Something as simple as asking your audience a question can do the trick; and it shouldn’t take you longer than a couple minutes to come up with. Don’t forget that practice makes perfect. Social media is no different than most other things you do. With practice, and some time, that it will become second nature and eventually easier. The more you schedule posts, engage with comments, and curate content, the faster you’ll find yourself being able to get it done. Rome wasn’t built in a day, and your social media strategy won’t be either, but if you use these tips, you may just find yourself having fun with it instead of struggling to find the time to implement it. Do you have any social media time-saving tips? We want to hear about them in the comment section below.